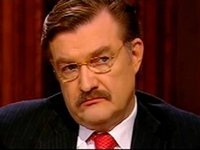 The host of the Black Mirror program on the Inter television channel, Russian Yevgeny Kiselyov, has been denied entry into Ukraine by mistake, a source in law enforcement agencies has told Interfax-Ukraine. "The issue concerns an entry ban for another person named Kiselyov. This mistake is currently being corrected," he said, adding that the issue concerns Russia Today Director General Dmitry Kiselyov. Interfax-Ukraine has not yet managed to get official comments from the State Border Service and the Security Service of Ukraine. Earlier media reports said that Yevgeny Kiselyov was banned from entering Ukraine on October 23. According to the journalist, he was informed of the ban on his entry to Ukraine under a decision of the Security Service of Ukraine. As reported, in late August 2014, Ukraine's National Council on Television and Radio Broadcasting published a list of journalists and chiefs of Russian television channels who could be denied entry into Ukraine. As of September 11, the entry to Ukraine was banned for 35 members of the Russian media market, including Russia Today Director General Dmitry Kiselyov.